‘Tis the Season!! Make a special someone an heirloom Christmas Stocking they’ll love for years to come! Turtledove Stocking is the latest in my series of stranded Christmas stockings, now available as a PDF pattern download or a complete kit including 100% Peruvian wool. Decorated with various Christmas motifs, a pair of cooing Turtledoves top off the merry design. The stocking measures 7” wide X 19” long/17.5cm X 48cm. Worked in the traditional 2 strand, Fair Isle method, never more than 2 colors are used per round. A total of 8 colors gives the stocking a unique, designer look and is color coordinated with my other 2 stocking patterns, Tannenbaum & Snowdance. Worked in the round from the bottom up, this pattern is fun and rewarding. Icord edging & loop finish the top and afterthought heel and toe are worked last. Purchase the COMPLETE STOCKING KIT through my Etsy shop Daydreamer Knits, or buy just the pattern as a downloadable PDF through Ravelry. Each kit includes a 8 color chart, uppercase & lowercase letter charts, step by step instructions and enough 100% Peruvian worsted wool yarn in each of the 8 colors required to complete your selected stocking. Your kit will be shipped within 2 business days of payment receipt, as well as a confirmation notice to your email address. 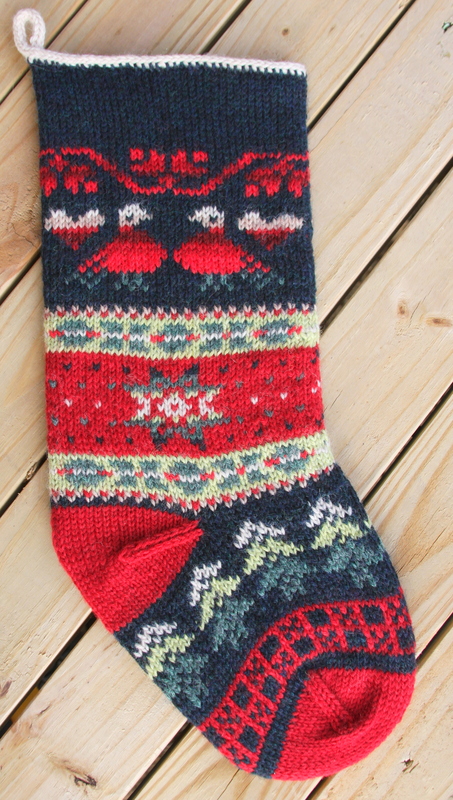 If you choose the pattern only, it includes the charts and instructions for your chosen stocking, excluding the yarn. It is available for immediate download upon payment receipt. Contact me @info@daydreamerknits.com if I can help you in any way.